making tattoos is very painful. 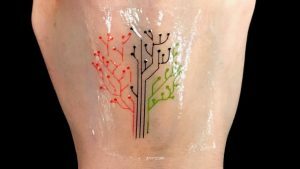 Both arguments are moot points according to today reality, because technology progress leaps forward, so also it concerns to the process of making tattoos. The first methods were really scary for modern people. So, rubbing paint in the skin cuts, and making punctures on the skin and dragging through these punctures a colored thread were normal for ancestors. In ancient times people made tattoos with the help of a needle. Firstly the skin was pierced, then the dye was applied to the upper layers of the skin. Then the wound was healing little by little, and dye was under the skin. That’s how first tattoos looked like. Today, the essence of tattooing has not changed, but progress has allowed changing the technique of creating tattoos. Modernization of the process began in the late XIX century in the US. Here was patented the first electric tattoo machine. Today tattoo masters use an electric machine with a sterile needle attached to a can with paint. The needle moves up and down, penetrates under the skin approximately 3 mm and leave dye inside. All modern tattoo machines are divided into three different types. According to the principle of work they are: inductive, pneumatic and rotary. To create tattoos very often induction-types of machines are used. These instruments have much less error in work, and also it is possible to adjust the amplitude of the needle movement. In addition, such machines are not bad for applying tattoos on soft tissues. Rotary-type of tattoos machines are very rarely used. But they are very useful in the application of dense and saturated color. The biggest advantage of such kind of machines – they work much quieter, then inductive ones. Pneumatic machines have appeared relatively recently, and they work as a result of supplying compressed air. Such devices are very quiet in operation and easy to operate. Currently, they are very rare in our market. The quality of the work of tattoo machines depends on: the correct combination of materials for work, the shape and geometry of the machine, the number of turns on its coil, the size of their cores, the quality of contacts and so on. And if the manufacturer makes a mistake, the inductive machine will not work as it should. In the rotary tattoo machine, the most important thing is the engine, and if it has high quality, this machine will work for a long time. As you understand, thanks to modern technologies the process of making tattoo isn’t so painful. So, if you decided to make tattoo you shouldn’t be afraid of the process. But if you are very scary even after reading articles may be you should think about this decision one more time. Only one thing you should do responsible – choose the tattoo and the master.